You are here: Home / Stakeholders / The Stakeholder Management Survey Results Are In! The Stakeholder Management Survey Results Are In! Thanks again to everyone who took my stakeholder management survey at the end of last year. It’s been insightful reading through the challenges you have engaging people on your projects. 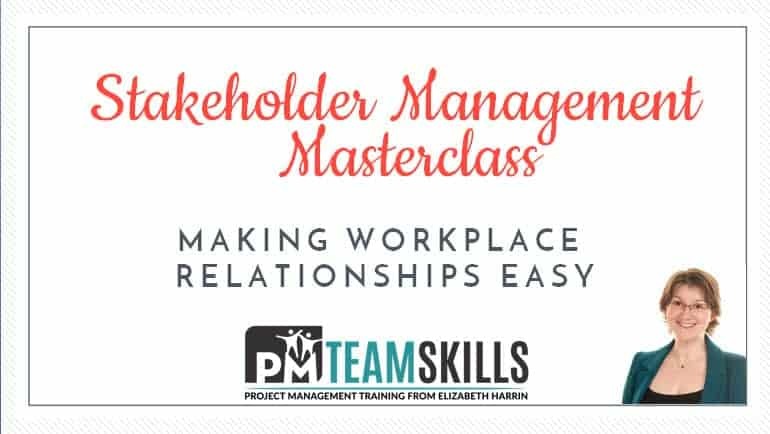 I’ve put together a Stakeholder Management Masterclass to help you create better working relationships with your stakeholders. Scroll down to learn more. Why Do You Do Stakeholder Management? Stakeholder management is something we talk about a lot in project management, but what drives people to do it? Especially as it is often a hard and thankless task, and one we don’t get much training in as project managers. Often it’s a few slides in a project management course encouraging us to complete a stakeholder register. My boss is making me do it. Nothing like a bit of honesty in an anonymous survey! 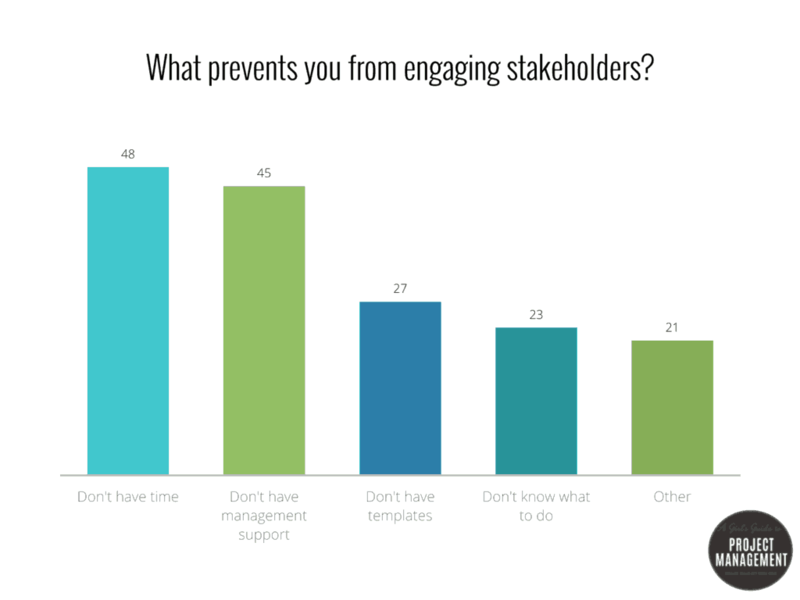 What Prevents You From Engaging Stakeholders? I’ve looked a bit more deeply into the results in this section now and here are the definitive responses to that question. I have to say that I agree. If you believe that stakeholders are crucial to the success of your project (and fair enough, you might not) then you need to put the effort in to bringing them along with you on this project. Not having the templates to do stakeholder management is also another excuse, although if you ticked that option it might feel like I was trying to trick you as it was one of the answers on the questionnaire. Sorry about that – I didn’t expect the responses to be so high! You can get templates in lots of places including many PM books, your colleagues, your PMO and I even have a set of done-for-you templates to get you started quickly. Not having management support was the surprise response for me in this set of results. If that applies to you, you should include your manager in your stakeholder group and work on their understanding of why stakeholder engagement matters. 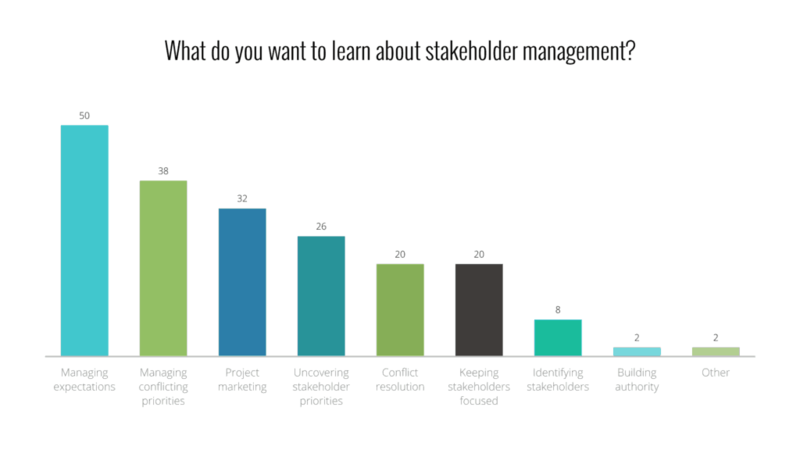 What Do You Want To Learn About Stakeholder Management? Given the mix of responses to earlier questions, from project managers who were obviously very experienced at juggling the office politics of stakeholder relationships through to those working in organisations where stakeholder management was somewhat immature as a concept, this question was interesting. The two top responses were managing expectations and managing conflicting priorities. These seem to be huge issues for people because many project managers are working on multiple projects with multiple stakeholders and are juggling lots of relationships. The good news is that I can help you with that. I’ve put together a Stakeholder Management Masterclass to help you create better working relationships with your stakeholders. It’s your compass to navigate the difficult terrain of stakeholder relationships. I wish I could wave a magic wand and give you the formulae that would work in every situation, but as every stakeholder and company is different, this is an area where there are no universal cheat sheets! What I can do is give you the tools, techniques and confidence to boost your stakeholder relationships at work so you can effectively decide which way on the map to go. When you know what to do and how to do it, and how to select what’s going to work in each situation you have the confidence to engage with project stakeholders. You gain authority and credibility. Your colleagues and stakeholders listen to you. People start to tell you things that affect your project without assuming you’ll find it out from somewhere else or don’t need to know. You have a clear engagement plan. And everything on the project starts coming together. We’ll cover dealing with stakeholders who aren’t engaged, conflicting priorities and practical tools for making workplace relationships easier. I like to think I’m known for my ability to keep it real! And I care about getting you results that will make a difference to how you build relationships at work. We’ll dig into what really works and there’s plenty of time for you to get your questions answered. I really hope you’ll join me in the Masterclass. Enrolment is open now and closes on 20 March. The live classes start on 22 March but you can get started today with the bonus content, handouts and templates. If you need an invoice or receipt to process the cost through your company then let me know and I’ll get that actioned for you. Here’s to your stakeholder success!